We know London has it all; pace, drama, excitement. That’s why locals love it and people flock to visit it. However in order to remain healthy and balanced, we must regularly escape the demands of everyday life. We need to make time to replenish, refresh and refocus ourselves. We all have our personal favourite places to find stillness and calm, but here are 5 ways relax London. For many, water is essential to meditation. London has many little known canals, lakes, and docks, where stillness is discoverable. 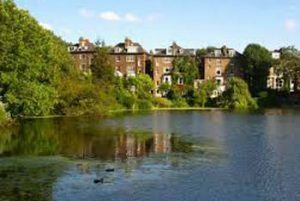 For a natural experience in an accessible way take the northern line to leafy Hampstead and enjoy the famous ponds. Whatever the weather or season, the feeling of peace and the gentle sound of birdsong will leave you nourished. Don’t forget your bathing suit, and immerse yourself entirely. If wild wet nature isn’t your thing, London has a multitude of beautifully manicured gardens. The trick is to find one that you can have to yourself for a spot of private quiet. 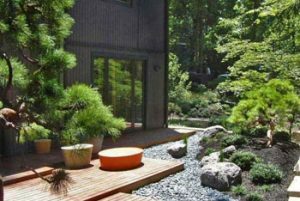 The School of Oriental and African Studies has a small but perfectly formed Japanese Zen garden, open and free to the frazzled Londoner. Open your mind and enjoy the quiet exhibitions downstairs as an added bonus. Find an oasis in the middle of London. Plants from all over the world. Take advantage of a new perspective, and aim for a spiritual high. London’s skyline is more accessible than ever before with access to the Shard, Tate Modern, the Olympic Park’s Arcelormittal Orbit, and the new city Sky Garden. But they are popular destinations and you won’t be alone. 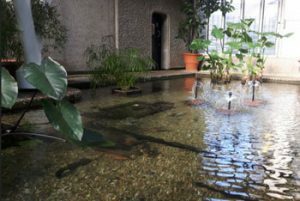 Therefore with quiet and relaxation in mind, lose yourself in the Barbican Conservatory, and discover a tropical oasis high up in the heart of the city. Guildhall Art Gallery London. Absolutely stunning. Look for a place below or inside if you want to really find peace. London has many spaces that welcome those wanting to find quiet. There are cemeteries, crypts, and unlocked places of worship in the city. 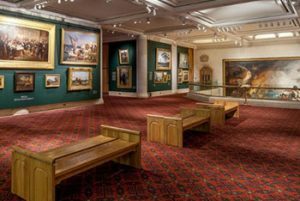 For some early spiritual sites, go underground in the Guildhall Art Gallery and connect quietly with ancient gladiators of the London arena. Or if that is too intense, join the non-denominational Quakers Weekly drop in silence session. Have a massage in London, to force all that stress away. Some people require activity or a certain level of physical interaction to balance and relax the body and mind. Personal preference will dictate which type of yoga or pilates is for you but ask friends, work colleagues for recommendations. And make sure you take medical advice before starting a new activity. If that is too much, London has a choice of professional and qualified holistic and massage therapies. The personal touch has proven health benefits, such as improved circulation, pain relief and better sleep. For the ultimate in relaxation, ask a qualified massage therapist to visit you at home. Let the peace and tranquillity come to you.